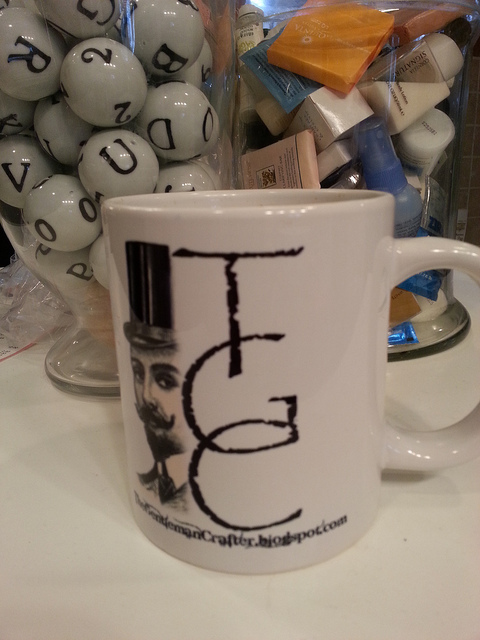 The Gentleman Crafter: It's Friday! YAHOOOO! It's Friday morning here in Texas! A bit overcast outside and chances for rain, yet there still seems to be this happiness in the air. The Spirit of Christmas is growing! I am so grateful to be alive and well and have such a wonderful family and such fantastic friends! I wanted to post something so you all know that I'm here! LOL! WOWWWW I have never been this busy in my life! Projects, crossing things off the Christmas lists, more projects, work, projects, keeping up with the laundry, projects, work, putting the last ornaments on the tree and finally more projects! All this to have 2 samples done and feeling the need to put it in high gear! OMGosh! I know we all are so busy this time of year, so today I give you a GREAT BIG YAHOOOO! You are doing an awesome job! LOL! As Dyan and Kaz would say...It's a MOOHOOSIVE Mug with my "logo" on it! I love it! It was designed by THE VERY CREATIVE AND MULTI-TALENTED CESAR! Thank you Cesar! You Rock! Well, I've got to run to work and then....Two Whole Days To Catch Up! Yahoooooo! Way to go Cesar for hitting the nail on the head! BTW - Love the balls in the glass jar too! The sun is shining here in Campbell River so this is a day for the record books...cheers and see you around the airwaves. Merry Christmas, Jim. What a great, upbeat start to the day. No rush to show us projects - you've given us plenty of wonderful projects to keep us busy. It's fun to have your CHA stuff to look forward to in January. It's funny isn't it how that darn laundry still has to be done. Cesar gave you an awesome gift - clever guy. Enjoy the hustle and bustle. There's a wedge of blue sky to be seen in Seattle. I'm going to hustle outside and replace a Christmas light string that's out. Forgot to mention - Pottery Barn has acute, little wine bottle topper with a top hat. Cesar you know you have done a magnificent job when your birthday present makes the front page :). Love the mug. It is so you. Congratulations Caesar on designing the perfect present. Cesar!!! You ROCK!!!! What a wonderfu, WONDERFUL gift for Jim!!! Your coffee is going to taste so much better in your personalised mug .... what a great gift! Very cool mug hope you have a good weekend. Cesar seems like a really great guy!!!!! So nice of him to come up with such a wonderful gift. It is so you!!!! Have a really great and productive weekend, I know I plan to. Still lots to do. I am so behind. It will take several all nighters to catch up. We all had the flu this past week, and really got behind. Have a great Christmas Jim I hope we see some of your fabby family video from your Christmas as it is so fun to watch. Christmas wishes to the rest of your family especially your mom she is a sweetheart. Wow! Cesar did a great job on the mug --it's absolutely perfect for you! Be sure to take a breath between all that business on your to-do list! So looking forward to seeing your projects in January! What a fantastic birthday gift!!!! Perfect gift Cesar! Don't you just love when that special thought goes into picking that perfect gift!? Make sure to slow down and smell the balsam Jim! Happy Holidays!! Awesome gift...the mug is wonderful. Nice you got a chance to take a breath on Friday...this week is going to be busy for us all. Happy holidays Jim! Oh what a wonderful mug! It's been crazy... I've had back to back concerts ...my craft area is calling me and I can't seem to get there and when I do I'm sitting there staring hehehe ... don't guess I'll get anything done that way!! Oh well hope your weekend was great ! LOVE the mug! Cesar is amazing!!!! !